The most common forms of ginger supplements include ginger powder, ginger capsules, and ginger tablets or pills. While all are effective in complementing your diet with the many health benefits, vitamins, and minerals that are found in ginger, it is important to know the difference between these different supplemental forms. Pills are a solid dosing form that can be swallowed whole and are distinguished by how they are manufactured, which requires wet massing or molding techniques. In contrast, tablets are a solid dosage form containing a compressed measurement of the active ingredient bound by an excipient, which is an inactive, soluble filler ingredient that helps the tablet to maintain its shape. In the past, pills were the more common solid dosage form, but in recent years, tablets have become the most widely-administered dosage form in the United States. TODAY, MOST PEOPLE USE THE TERM “PILL” AS A GENERIC DESIGNATION FOR ANY DRUG OR SUPPLEMENT IN HARD FORM. 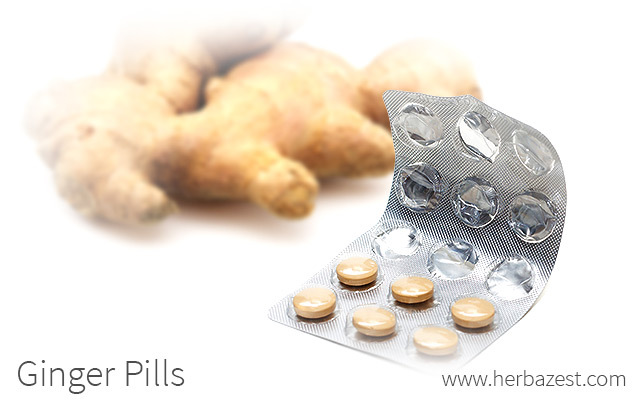 All ginger pills or tablets contain the active ginger plant compounds, but they also contain inactive ingredients called excipients, which give the tablet its desired consistency and help the body absorb the active constituents. Commonly-used pharmaceutical excipients include bulking agents, mostly lactose and microcrystalline cellulose; disintegrants, usually derived from rice, potato, wheat, or corn; binders, such as polyvinyl pyrrolidone (PVP) and hydroxypropyl methylcellulose (HPMC), which give tablets their hard consistency; lubricants for easing ingestion; and glidants to aid powder flow. Though rare, excipient allergy from drugs and supplements can happen. Sometimes, the allergic reaction is caused by the active ingredient, but it is possible to have an allergic reaction to the bonding agents that form part of the pill or tablet. It is recommended that adults consume no more than four grams of ginger a day, while a daily dose of one gram should be the limit for pregnant women. Before starting to take ginger pills, be sure to consult your doctor concerning the right dosage for you. One of the many benefits of ginger pills is that they break down gradually when they are coated, thus reducing the possibility of stomach discomfort. Additionally, their shelf life can be of two to three years. Ginger pills are especially recommended to reduce inflammation and pain, as well as nausea and vomiting, making them an ideal treatment for headache, migraine, arthritis pain, motion sickness, and pregnancy-related nausea. Furthermore, current research suggests that taking ginger pills may be effective as a preventative agent for heart attack and stroke, as well as for reducing blood sugar in diabetic patients. Ginger pills are available in many places, including grocery stores, drugstores, natural food stores, specialized natural health and nutrition stores, general merchandise retail stores, and even online. Though not as common as tablets, the great number of places where ginger pills are available for purchase make this type of supplement very easily accessible. Because of the pharmaceutical excipients that are included in ginger pills, they are not the purest form of ginger supplement available on the market, though their properties do allow for a gradual release and better absorption of ginger constituents in the body.